This holiday season, Xbox 360® fans can accessorize even further. Microsoft’s award-winning Xbox 360 Wireless Controllers are now available for a limited time in red with newly designed black accents. Experience wireless gaming from up to 30 feet and enjoy uninterrupted play with the included Play & Charge cable and red rechargeable battery, which provides up to 25 hours of play on a single charge. When the battery runs low, you’re given ample warning so you can connect the included Play & Charge cable for continuous play. Play in style this holiday with an all-new color. 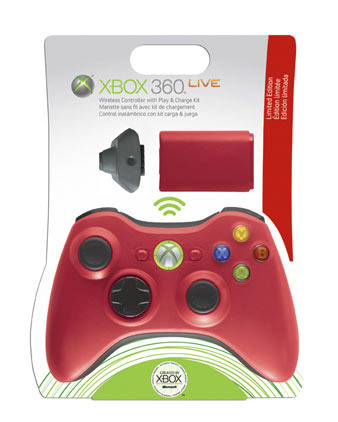 Available in the U.S., Canada, Latin America, Australia, New Zealand and Asia, the Xbox 360 Limited Edition Red Wireless Controller and Play & Charge Kit with red rechargeable battery come together at the exceptionally low price of just $64.99 (U.S. estimated retail price). This product is the newest addition to Microsoft’s line of Xbox Authentic Products and further reinforces Microsoft’s commitment to enhancing the way people experience games and entertainment.